PINE BLUFF — Garrett Bock made a couple of spectacular catches in center field on Saturday and another that looked easier that it was, but the toughest play he had to make may have been before the game when he caught the ceremonial first pitch from his grandmother Joann. But he speared that one too. Then he gave her a hug. “She’s gotten better,” he teased after the game. You see, it wasn’t the first time Garrett had caught the ceremonial first pitch from his dad’s mom at the tournament named after his late grandfather, the legendary Billy Bock, but it will probably be his last, at least for a while. The senior has played in four of the Classics on teams coached by his dad, Kirk Bock. And the last one couldn’t have gone much better. And Garrett was named the tournament MVP, joining teammates Brady Butler, Lucas Castleberry and Jordan Taylor on the all-tournament team. In 12 plate appearances during the three-game tournament, Bock was on base 10 times. He scored seven runs, walked five times, stole four bases and drove in two. Bringing it full circle, Kirk’s mom presented the championship trophy to the Hornets. The Hornets scored in every inning of the run-rule victory against a Woodlawn team that came in 11-1 after finishing as the Class 2A State runner-up last spring. Sophomore Jordan Taylor got the win with last-out help from Ben Wells. Along with Mayall, Chris Joiner had three hits. For Mayall, it was a bit of a breakout. The team’s leading hitter last year, the junior had been scorching the ball all season but right at the defense. Coming into the game, he had managed just one hit in his last 15 at bats, though he’d been coaxing his share of walks along the way. Saturday, he found the holes and drove in two runs in the process. Woodlawn grabbed an early lead in the game when Jordan Spates, the Bears’ starting pitcher and lead-off hitter, slapped a double into the left-field corner. Tyler Reynolds beat out a bunt single and Bradley Wallace picked up the RBI when he grounded to Tyler Brown at third for a force at second. Spakes would finish with three of his team’s seven hits in the game but he allowed eight in four innings of moundwork. Bryant tied it in the bottom of the inning when Joiner blooped a double in no-man’s land behind third. With one out, Mayall singled sharply up the middle to send Joiner to third then Brennan Bullock drove in the run with a sacrifice fly. 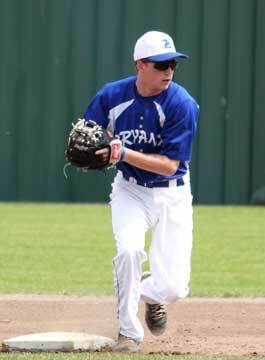 Garrett Bock robbed Ryker Smith of extra bases with a diving catch in the gap to start the second inning. After Taylor fanned Davey Earnest, Andrew Jackson reached on as only error. Jonathan Dickey followed with a drive to right-center but Bock again made a diving catch to take away extra bases and end the inning. In the bottom of the inning, Butler was hit by a pitch and stole second. An out later, Caleb Garrett drew a walk and B.J. Ellis was hit by a pitch to load the bases for Joiner who singled to right to plate a run. Bock drew a walk to force in another and it was 3-0. Spakes led off the third with a single and, an out later, Taylor issued his only two walks of the game, putting on Wallace and Cody Foreman to load the bases. But, using the fake-to-third, throw-to-first move, Taylor picked Foreman off first to take much of the starch out of the Bears’ rally. Dillon Miller popped out to Joiner at second and Taylor had worked his way out of the jam. He then singled to start the bottom of the inning and courtesy runner Hayden Daniel scored when Butler blistered a drive off the deep center-field wall for an RBI triple. 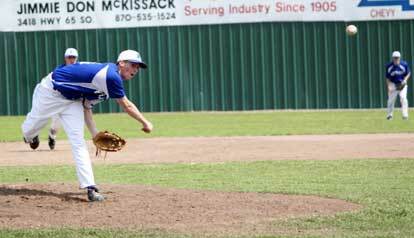 Spates responded with three strikeouts to force the Hornets to strand Butler at third. But Taylor pitched around a two-out double to Jackson in the top of the fourth. 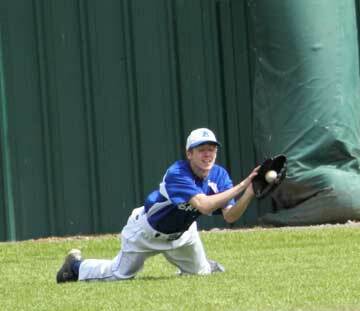 He got a little help from Caleb Garrett in right, who made a diving catch to rob Dickey again. Spakes started the bottom of the fourth with his fourth straight strikeout but Bock worked him for another walk, Mayall roped another single to center and Bullock took one for the team to load the bags for Taylor who grounded into the hole at short for an RBI single. Butler smacked a two-run single to left and it was 7-1. The third hit by Spakes started the top of the fifth. 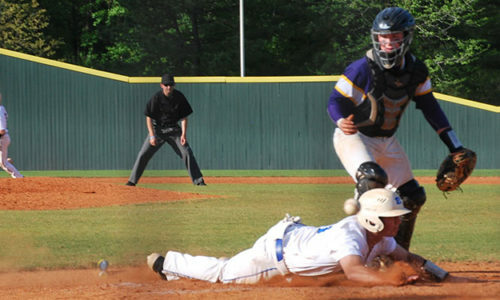 He stole second and, an out later, Wallace, who has signed to play at Arkansas State next year, lined one over the boards in left for a two-run homer. To his credit, Taylor came back with three straight strikes to Foreman to get the second out. But when Miller singled to left, Coach Bock decided to bring in Wells. The senior right-hander overpowered Smith, striking him out to end the inning. “I was trying to get J.T. through the fifth and then bring in Wells but it worked out pretty good,” Coach Bock said. “Ben had to throw today anyhow because he’s going to throw on Tuesday against Niceville in the Florida tournament. He was able to get his ‘pen in then get out on the mound a little. They were, however, through with playing defense in this game at that point. A six-run fifth ended the game. Caleb Garrett started and ended the inning. To start, facing Earnest the Woodlawn reliever, he walked and stole second. Landon Pickett chopped a single over the third baseman for an RBI then hustled to second when the ball was misplayed in the outfield. Joiner beat out an infield hit and stole second before Bock walked to load the bases for Mayall who sent a laser to right for a two-run single. Foreman relieved and got Bullock to ground to short but Spakes’ wild throw to first allowed two more runs to score, making it 12-3, a run away from the run rule. Taylor’s groundout to first sent Bullock to third so, with one out, Butler and Castleberry were given intentional walks to load the bases and set up a force at every base. But Garrett spoiled that strategy when he lined a single to center. The win improved the Hornets to 11-0 as they head to Destin, Fla., for a spring break tournament. They open at Niceville High School on Tuesday at 6 p.m.
One out when game-ending run scored. E—Castleberry, Spakes, B.Brown. LOB—Woodlawn 6, Bryant 9. 2B—Spakes, Joiner, Jackson. 3B—Butler. HR—Wallace. SF—Bullock. SB—Spakes 2, Mayall, Butler, Daniel 2, Garrett, Joiner. Congrats Kirk and G. I know Coach Bock is proud of what you have done and what you are doing. Coach was such a big presence in my life, and I know that you are doing the same for players today. Good luck in Florida. Have fun, play well, then come back and get ready for a great April and May. Way to go HORNETS! CONGRATS on the win! !